Armour Fleece is light, breathable & stretches for superior mobility . Soft inner layer keeps you warm & comfortable. Stretchy elastic waistband with external drawcord. Straight leg fit. Open hand pockets. Inseam: YMD 27" (+/- 2" per size). 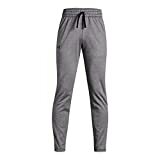 Interested in the Under Armour Boys' Armour Fleece Pants, Charcoal Light Heath (019)/Black, Youth Medium? Is the price too high? You can easily price watch this product and we'll notify you when the price reaches your target.